In times gone by, police and fire departments, municipal governments, and newspapers issued press credentials in the form of badges. Some such "press badges" were similar in appearance to their corresponding city police and fire badges of the era. As with the laminated plastic press credentials of today, these early press reporter badges allowed newspapermen to cross police and fire lines, and gave them accessibility to courts, offices, and governmental functions. Despite their scarcity -- relatively few of them were issued over the years -- the collecting of press badges today is an adjunct to the collecting of police and fire badges, and many law enforcement or fire badge collections may contain one or two "police line" or "fire line" or reporter badges. My collection consists of some 150 press badges in many designs, shapes and sizes, issued by police and fire agencies, by cities large and small, by state governments, and by newspapers now long out of business. This official-issue Entenmann-manufactured Los Angeles Police Department reporter badge, probably from the 1940s, was the same eagle-top shield design as the LAPD "Series 5" police badge of the same era. The enameled city seal appears in the center design, a feature that was later changed. This sunburst nickel-over-brass reporter's badge was issued by the Denver Police Department between 1896 and 1915. The solid-back two-and-one-half-inch badge was manufactured by Sachs-Lawlor, the famed Denver badge-making company which produced Denver's badges even into the 1960s. 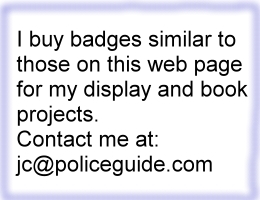 A fine example of a department-issued press badge.. This early official-issue Seattle Police Department press badge is of the same design as Seattle police badges of the era. 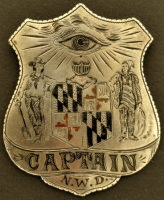 The slightly convex unhallmarked badge is two and one-half inches tall. This imposing, almost three-inch, official reporter badge was issued by the city of Philadelphia and has a large-size, crisp-relief city seal in the center. The multifunctional badge probably admitted the bearer past police and fire lines, as well as to official municipal functions and meetings. Early T-bar pin. This early Minneapolis Police shield is unusual in that it carries a rivet-attached and oversized city seal. Two inches; backmarked "Twin City Stencil Co." Stencil and stamping metalworkers, and stationery letterhead engravers, were responsible for many early badges such as this example. 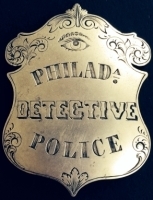 This two-inch badge with a custom-die center Philadelphia city seal is unusual because it was issued by the Police Department, but offered Fire Line privileges. The badge's numeral could not have been chronological for press badges, but probably instead was arbitrary, or in series with police badge numbers. Hallmark: O.C. S&S [Stencil & Stamping?] Works, 234 Arch St., Phila.. This scrolltop press reporter two-inch badge was issued by the St. Louis Police Commission in the early 1900s. The designation "M.P." is a term borrowed from New York City and Washington D.C. usage, and stood for "Metropolitan Police." Hallmark: Steiner S&S [probably "stencil and stamping"] Co., St Louis.. Older than most and thin hand-tooled nickeled brass, this two and one-half inch balltip star carries three type faces including two lines of "Barnum & Bailey" or "circus" type. The "Correspondent" designation probably means that the badge was carried by a rural freelancer, rather than by a staff reporter. The badge was his proof that he actually worked for the paper. The Sentinel has had an uncommonly lengthy run: It was founded in 1837 and survives even today as the Milwaukee Journal Sentinel. Probably circa 1900. Unhallmarked. Newspapers, as well and police and fire agencies, issued press-credential badges. This handsome two-and-one-quarter-inch Boston Herald badge is unusual on two counts: It is dated on its face (1922), and it carries a dark-red enameled bar. Backmark: S.M. Spencer Mfg. Co., 9 Cornhill, Boston, Mass. The Boston Herald also issued a different-style badge for use exclusively by its reporters at the fire department. This unusually large (three and one-quarter inches) Chicago Tribune badge served a dual function: It was "officially" a plant guard badge, but it and ones like it were frequently borrowed by zealous reporters to circumvent police lines. Police at the turn of the century were always anxious to get their names in the paper, so they allowed such practices. Chicago was a tough and highly competitive newspaper market, with some of the best reporters in the nation stopping at nothing to get the "scoop." The holder of this No. 1 badge probably was the paper's top reporter. The numeral is applied brass. An unusually striking early press badge..
Delicate little one and three-quarter-inch garlanded and gold-toned badge issued to reporters by the Dallas Police Department in the late 1920s into the '30s..